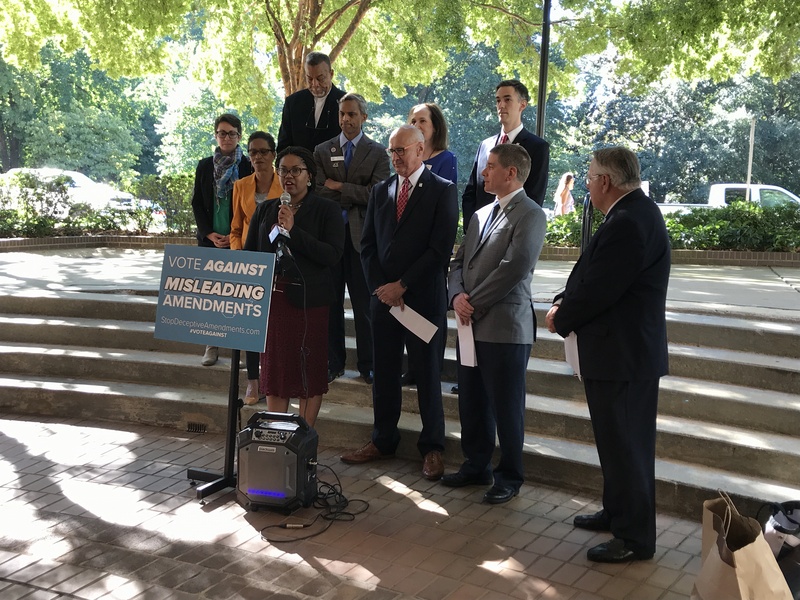 Elected officials gathered Friday morning outside the Raleigh City Council building to encourage North Carolinians to vote “No” on all six constitutional amendment proposals on the November ballot. Early voting starts next week, so campaigns for and against the six amendments are ramping up. The amendments are a proposed cap on state income tax, a photo identification requirement for voting, a hunting and fishing measure, a legislative appointment process for judicial vacancies, a reorganization of the State Board of Elections and Ethics Enforcement and a victim’s right proposal. Lawmakers have not included how each of those measures would work if approved by the public but plan to sort out the details in a lame-duck session if enacted. Thirty-eight local elected officials from around the Triangle signed on to a letter Thursday detailing the harmful impacts of the proposed amendments to their communities and encouraging their constituents to oppose them. At the Friday press conference, they continued to highlight their concerns. Danielle Adams, Durham County Soil and Water Supervisor, said lawmakers are asking voters to write them a blank check to fill in the details later. She spoke specifically about the hunting and fishing amendment, noting the right to hunt and fish had never been threatened in North Carolina and the proposal is unnecessary. “They want us to vote now and ask questions later,” she said. Morrisville Mayor TJ Cawley spoke about the measure that would reduce the current nine-member State Board to eight members — four Republicans and four Democrats. He said that enshrining partisan gridlock on the State Board could jeopardize early voting plans for local towns. He added that an amendment that would benefit all parties and all North Carolinians is not before the voters: one that would eliminate partisan gerrymandering in mapmaking. He also said the current amendments are vague but crafted to appeal to voters. “The closer you look, the worse they are for our communities,” he said. “As representatives of local governments across North Carolina we urge our fellow citizens to vote against all six constitutional amendments,” it states.